The layers were finally able to work the leaf litter yesterday for bugs, shoots, and other morsels exposed by the retreat of the recent snow. Our birds have never liked to be out in either snow or ice; they’re happy to get out and about on frozen ground so I don’t think it’s the cold – they just don’t seem to like the feel of snow and ice on their toes. If there is snow on the ground every last bird will remain in the chicken house until encouraged out. Once out they will seek shelter rather than walk about to forage – go figure. So, yesterday was the first day in a week or so that they were really able to move about and get down to business – they were busy and seemed delighted by the good weather. Lots has been written about the quality of eggs from free range chickens. A piece in Mother Earth News claimed that eggs from pastured birds contained 1⁄3 less cholesterol, 1⁄4 less saturated fat, 2⁄3 more vitamin A, 2 times more omega-3 fatty acids, 3 times more vitamin E, and 7 times more beta carotene than eggs produced by commercial (confined) birds. Joanna has always remarked that our eggs simply LOOK better. I found the image below at a Word Press blog entitled the Nourishing gourmet … the pastured egg is on the right … which would you rather eat? 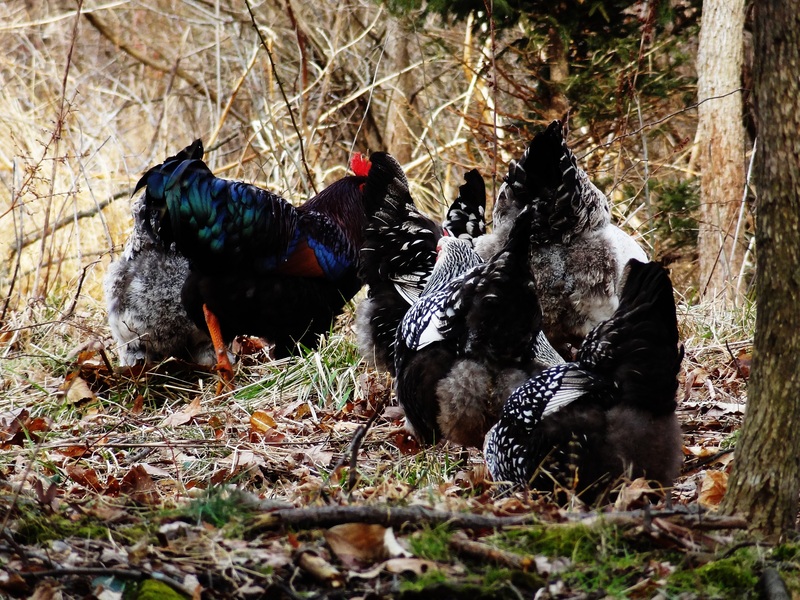 We currently run a small production flock comprised of Silver Laced Wyandottes, Light Brahmas, Partridge Rocks, and Speckled Sussex. With just two of us at home even a very small layer flock can quickly provide a surplus of eggs – we currently have ten dozen in storage. When such a surplus presents itself we usually respond with a batch of popovers … and soup for dinner. Preheat oven to 425 ºF. Grease a popover or deep muffin pan by rubbing with butter or by spraying with a nonstick cooking spray. Heat pan in oven for a few minutes. Beat eggs with milk. Whisk in flour and salt and pour in to muffin cups, filling them 1/3 full. Bake 20-30 minutes or until puffed and brown. Turn out of pan and prick all over with a skewer to allow them to hold their shape. Serve with butter or margarine.